We have a 2007 Outback. It will crank but won’t fire. Has spark, compression and fuel. Pulled the ECM — the T817 section looks different then the rest of the board on the front and back. Could this be the problem? Failures in the 2007 H4 ECM are rare, very rare. For readers . . . Which Outback model, engine and transmission? Did the engine work fine and then suddenly stop working? Has spark, compression and fuel. Can you provide details on each (e.g., what tests were performed and their results), so that suggestions won't be repeating what you already did? there are only 2 ECU that have problems on this board without being a flood car. turbo people that have had a problem reflashing while tuning. but plain jane EJ251/ EJ253....hard to remember anyone really typing about them ever. The two replies you have above are from well respected forum members so please note their advice that the ECU/ECM is rarely a problem and is unlikely to be the problem in your vehicle. I agree that the ECUs are generally bulletproof and reliable. HOWEVER: I did own a 2006 Baja which radiator-fans were running ALL THE TIME the key was on. This was traced to a TSB (technical Service Bulliten) which the ECU was at fault. The ECU 'drivers' for the fan-relays would fail in a 'shorted' condition which kept the fans running all the time. Even my ECU failure did not affect engine-running. ONE COMMENT regarding the photos above, that green-fuzz on the circuit-boards seems to indicate copper-corrosion. Did this ECU get waterlogged? Pulled the ECM — the T817 section looks different then the rest of the board on the front and back. Could this be the problem? Looking at your first image, T817 is a non-populated part, and you'll see several other land patterns near it that are in a similar situation (e.g. C808). 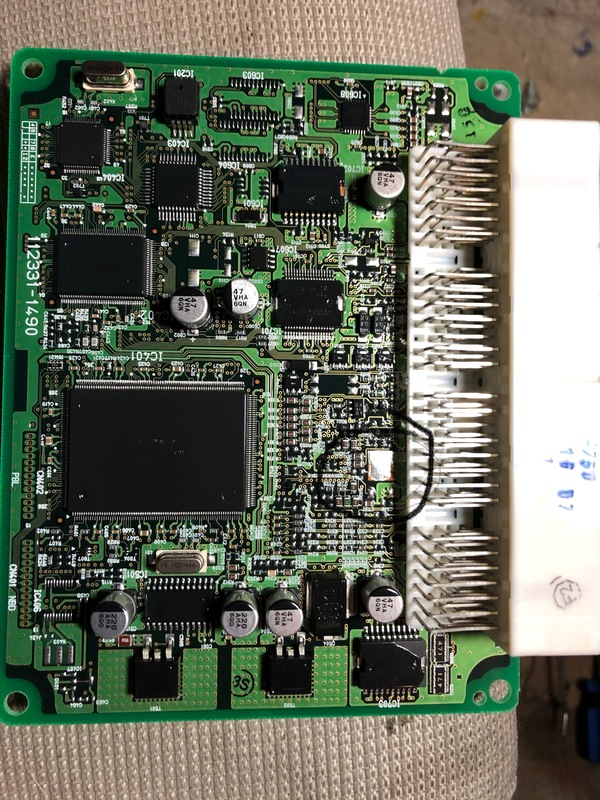 Board designers like to put other circuits in at times that aren't necessarily needed for the present application, or to deal with "what if" scenarios, or whatever reason (sometimes it's "nature abhors a vacuum"). It's likely the way it's supposed to be, and it's normal. So the comparison you should make is to a known goon ECU, although I agree with the others, it's highly unusual. 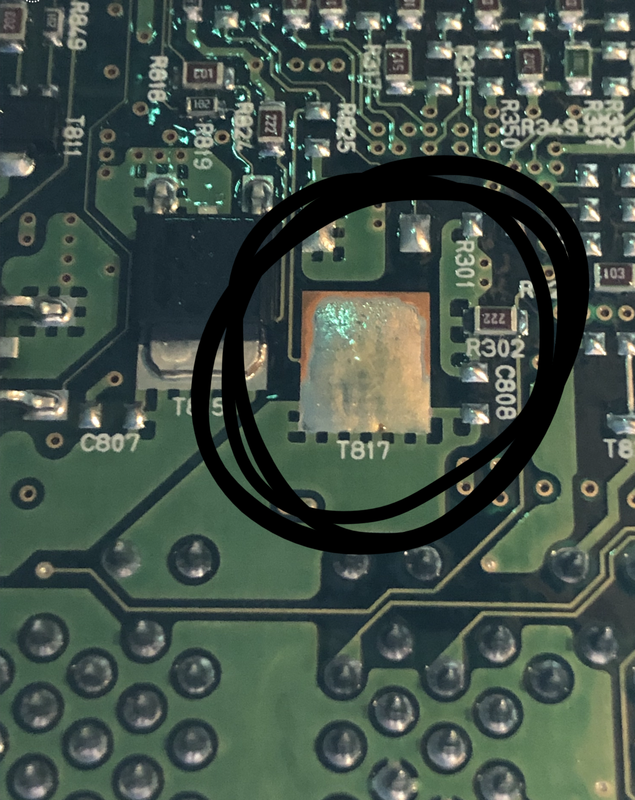 Regarding the color of the pad, for whatever reason, this is likely a heat sink attachment point for T817 which didn't get solder paste screened on prior to parts being assembled and then reflowed, leaving bare copper exposed. This can corrode easily in the presence of electric field intensity and moisture. Which brings me to the point @brucep raised, was this car ever waterlogged? A failiure of ECM is like a .00001% chance, unless the car was flooded like in a flood or hurricane. I wouldnt not have messes with it at all, your problem was somewhere else. Now that you have messed with the brain, anything could be possible. did you use static discharge gloves when handling it? Did you have the battery disconnected and discharged before you unplugged it etc? Wow, why did you go to that. Maybe your chip key has failed. ? If you had spark, compression, and fuel, the engine would run. How did you test each of those paths?